TC3’s Spring Concert – June 6. 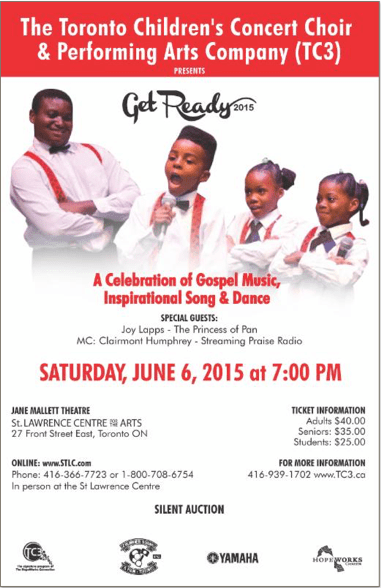 The Toronto Children’s Concert Choir and Performing Arts Company (TC3) is having its annual Spring Production and fundraiser on Saturday June 6th 2015, 7:00pm at the Jane Mallett Theatre in the prestigious St. Lawrence Centre for the Arts. TC3 operates out of Weston and rehearses in the Weston Park Baptist Church at Lawrence and Weston. This year’s concert, entitled “Get Ready”, is a celebration of gospel, cultural and inspirational music, African, Hip Hop and contemporary dance and African drumming. TC3’s young people are not only known for their talent but for their song writing creativity and ability to add a gospel touch to popular musical selections. Special guests include Joy Lapps, known as the Princess of Pan and MC: Clairmont Humphrey, Streaming Praise Radio. Get Ready announces the beginning of an exciting season for TC3 as it begins a year of Anniversary celebrations: 15 years of changing the lives of youth! Early bird tickets can be purchased at a discount of $5.00 off until and including Saturday (ignore the deadline on the poster). 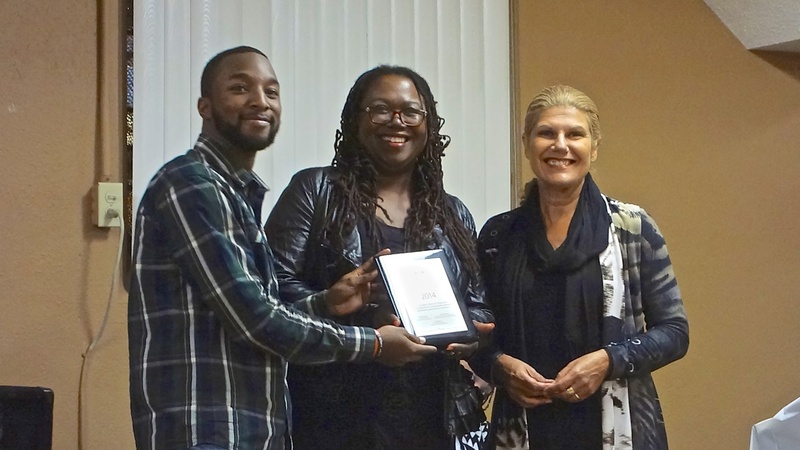 Soundcheck’s Joel Reid and Reverend Denise Gillard receive a Trillium Award plaque from MPP Laura Albanese. Reverend Denise Gillard had some celebrating to do last night. After years of using older instruments for her youth based organization, The Hopeworks Connection, the Trillium Foundation approved their grant application and came through with a $14,100 grant towards the purchase of musical instruments. With this purchase, HWC is able to support the youth-led organization ‘Soundcheck’ in the Weston community. Through HWC, SoundCheck’s youth mentors are able to offer “Hear Me Play“- a program which provides personal development workshops and the opportunity for youth to work with experienced musicians and learn to play an instrument. Hopeworks uses Weston Park Baptist Church as a base. Pastor Alan Davey was on hand to offer his congratulations. Until the beginning of this month, Reverend Denise also worked at Frontlines but will now focus full time on her Hopeworks Connection. MPP Laura Albanese presented Reverend Denise with the cheque and a plaque. Councillor Frances Nunziata also attended and offered her congratulations.